Zahra Bouychou, 2012-2013. Photo © Serge Anton. For the first time, over one hundred imaginative carpets, created by the women of Morocco's Aït Khebbach nomadic tribe, have made their way from the sandy Sahara desert of their origins to comprise the final exhibition of Zurich's, Museum Bellerive until January the 29th 2017. The exhibition, Couleurs Désert-- made up of items from the private collection of Eric Ossart and Arnaud Mautieres, through the curatorial support of the Musée Bargoin in Clermont-Ferrand--highlights the beauty of these traditional cultural specimens through not only the carpets themselves, but also through a compilation of photographs and videos taken by Serge Anton, which bring the lives of the over twenty weaver-women who created them "to life." 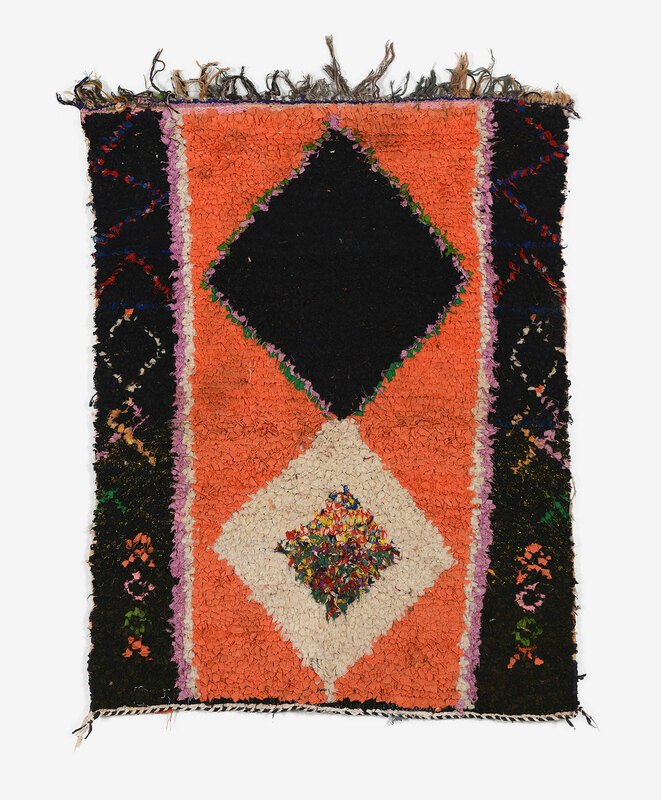 The colorful heritage of these carpets reads as a history of the tribe itself, since so much of its cultural development can be seen to be woven--literally--within them. 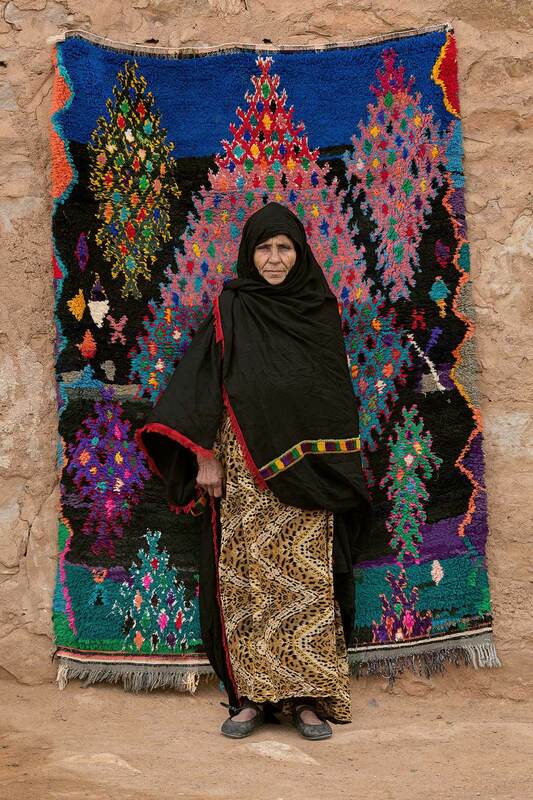 It's interesting to note how the women have traditionally used the various materials that they have the easiest access to in the creation of the carpets. Originally, (we're talking 16th century) this included goat, sheep and camel wool. 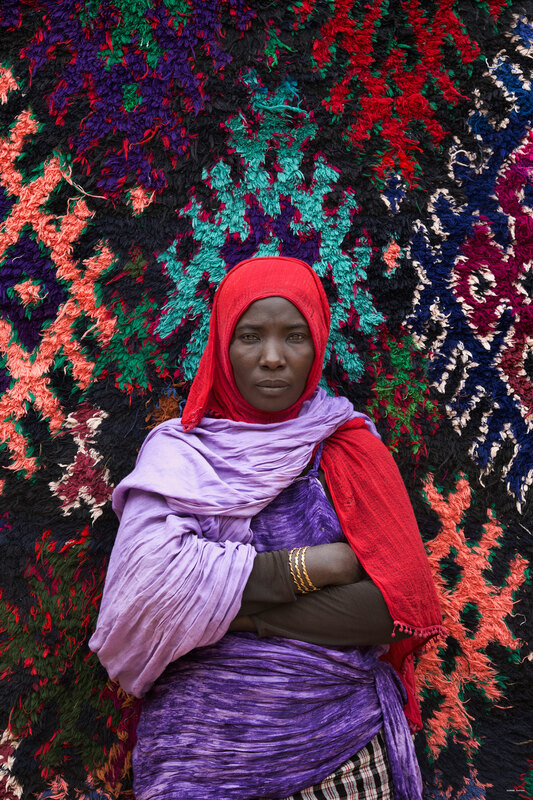 Much later, beginning in the 1980's, the materials used by the Aït Khebbach women changed as the tribe evolved. Now, the weavers utilize used clothing which they gather from various "Western collection points," artfully upcycling worn-out knitwear by cutting them into long strips and weaving them on the loom. As a result, the formerly flat, dense weaves have become much more "textural," since each carpet is now made up of different materials of varying textures. 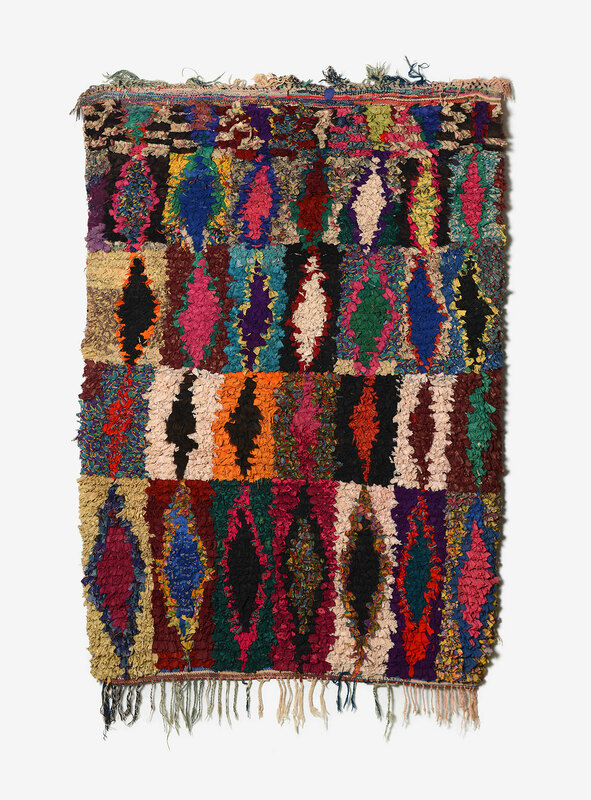 Touda Boumrour, Lahfira, rug, 1994. Photo © Rémi Boissau - Ville de Clermont-Ferrand. Touda Boumrour, Lahfira, cushion, 1996. Photo © Rémi Boissau - Ville de Clermont-Ferrand. Zahra Fatah, Aferdou, rug "Boucharouette", 2000-2009. Photo © Rémi Boissau - Ville de Clermont-Ferrand. Although there is nothing uniform in the patterns that comprise the carpets warp and weft, there are some almost animated, simple forms that make recurring appearances, regardless of the carpet's final size and the textiles used. For instance, some carpets are very nubby; their featured mish-mashed pattern obviously the result of necessity depending on the material that was at hand to weave into the loom as the weaver went about her task. With that being said, some carpets feature more grid-like patterns, such as colorful checkerboards or diamond grids which are obviously the result of careful planning on the part of the weaver in terms of the care she took in the carpet's creation which is more than visible in the finished product in terms of patterns and colourways. 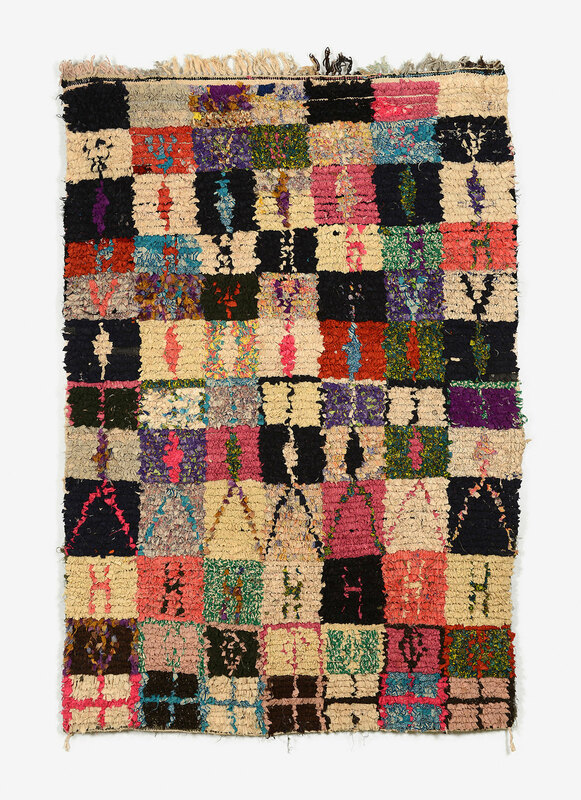 There is also a modern addition to the more time-laden patterns: the appearance of the last letter of the Berber alphabet, the "yaz," utilized as a pattern in the weavings which they say is used as "a symbol of the tribe's new self-conception and pride in being Berbers." Whatever the reason, it is fittingly intriguing. 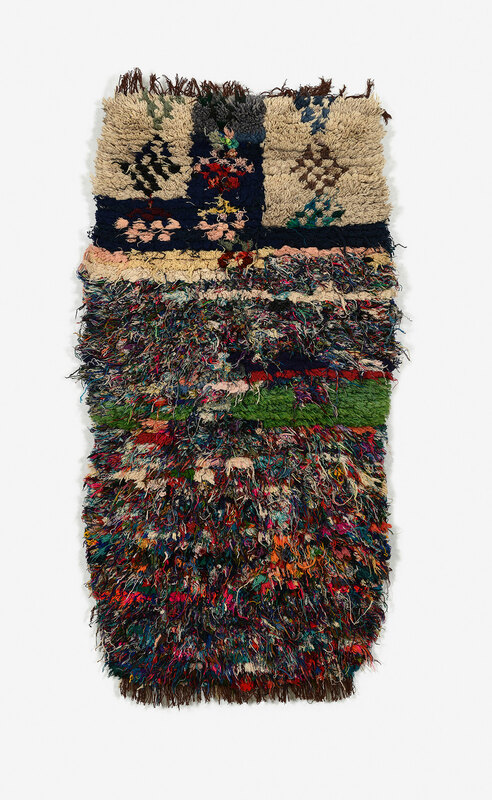 Fatima Oumharch, Tafraout, rug, 1990. Photo © Rémi Boissau - Ville de Clermont-Ferrand. Ultimately, these carpets’ patterns are like a language that was developed through the loom and thread--a societal story that is silently told in the finished items. They prove, once again, how art transcends its creators, the area of its birth and even the reason it was made in the first place to become something that everyone can understand, a visual language superior to anything that can be expressed with words. Fatima Oumharch, 2012-2013. Photo © Serge Anton. Aïcha Salmi, 2012-2013. Photo © Serge Anton. 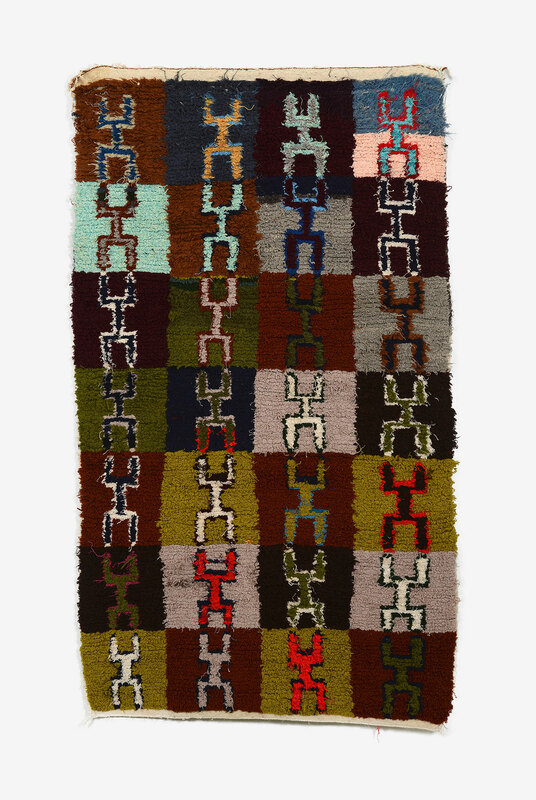 The colorful heritage of these carpets reads as a history of the tribe itself, since so much of its cultural development can be seen to be woven —literally— within them. 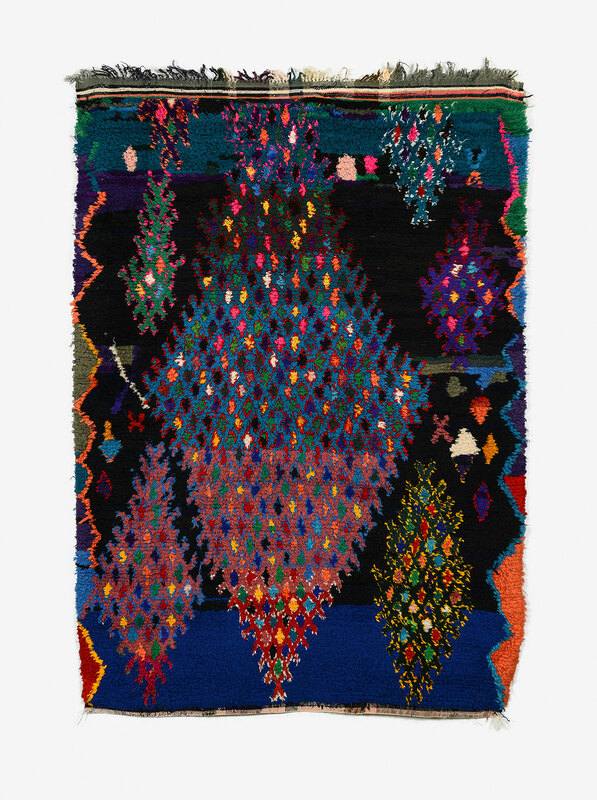 Aïcha Salmi, Ighfnighir, rug, 1997-2000. Photo © Rémi Boissau - Ville de Clermont-Ferrand. 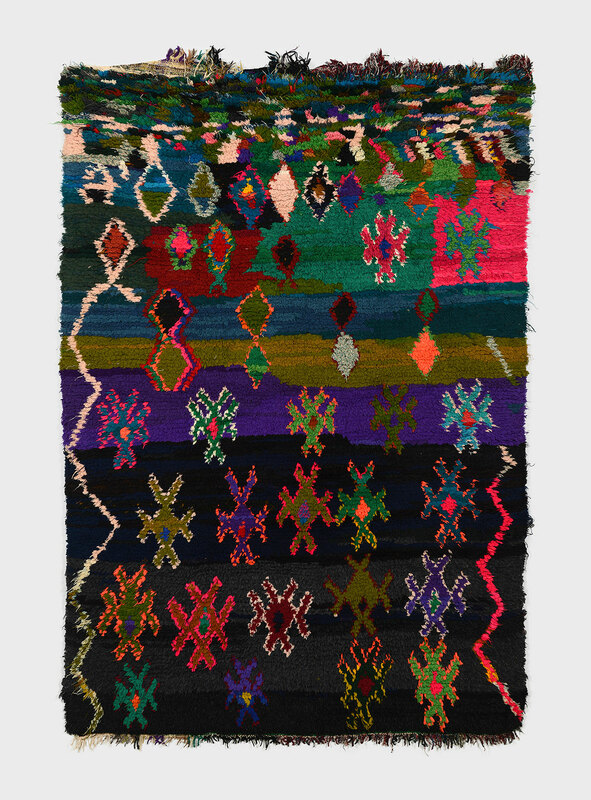 Aïcha Salmi, Ighfnighir, rug, 2000-2009. Photo © Rémi Boissau - Ville de Clermont-Ferrand. 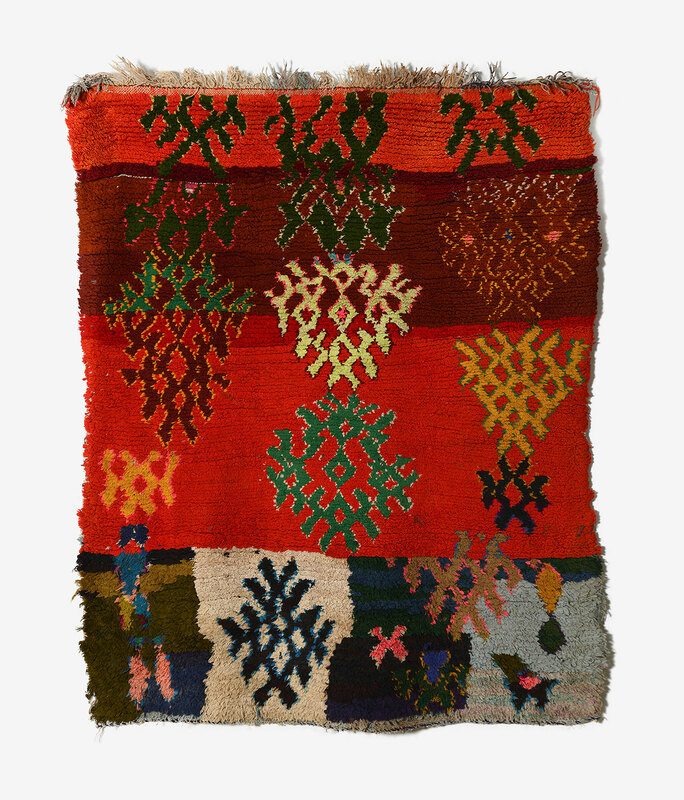 Setra Aït Hammi, Lahfira, rug, 2000-2005. Photo © Rémi Boissau - Ville de Clermont-Ferrand. Fatima Ohama, 2012-2013. Photo © Serge Anton. 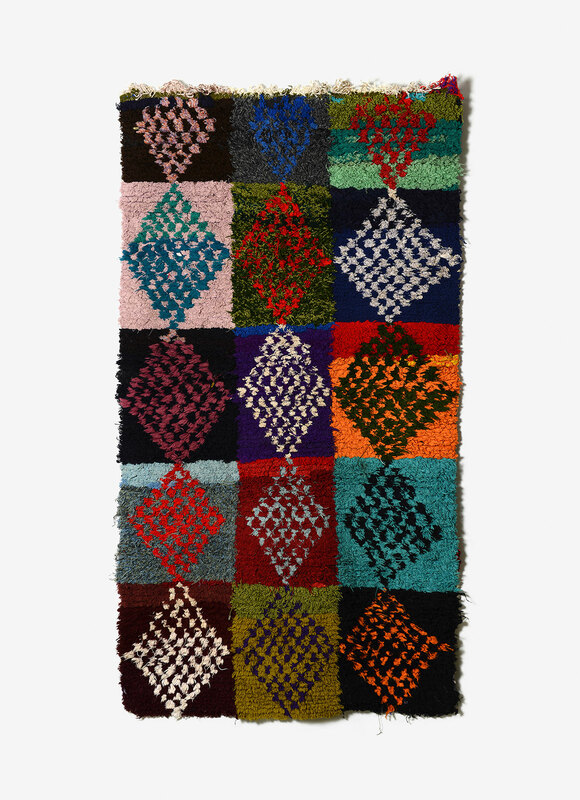 Zahra Khouya, Tazoulaït, rug, 2008. Photo © Rémi Boissau - Ville de Clermont-Ferrand. 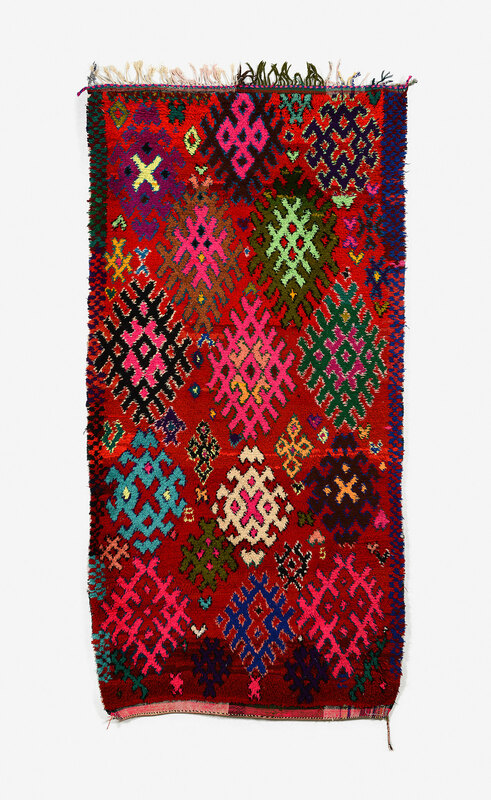 Zahra Bouychou, Aferdou, rug "Boucharouette", 2000-2009. Photo © Rémi Boissau - Ville de Clermont-Ferrand.